‘Babe Ruth’ (1895-1948) – Influential baseball star, who dominated the sport in the 1920s and early 1930s – setting new records and raising the popularity of the game. One of the first great stars to transcend sport and became a national icon – epitomised the ‘American Dream’ and the era of ‘The Roaring Twenties’. 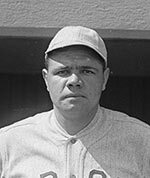 George Herman Ruth Jr, ‘Babe Ruth’ was born 6 February 1895 in Baltimore, Maryland, US. His parents were German American immigrants. He was one of eight children, but six of his siblings died early. His childhood was tough because his parents owned a tavern and had to work long hours to earn an income for the family. It was also a rough neighbourhood, with street fights common. Although details of his child are scant, his father drank heavily, and Babe Ruth later said his father died in 1918, after being involved in a street fight. As a child, he spent many hours looking after himself, and as a result often got into trouble. Aged seven, he was sent to study at St Mary’s Industrial School, a Catholic school run by monks of Xaverian Brothers. As an adult, Babe Ruth said that he would often miss school, drinking beer when his father was not around. In February 1914, when George Jr was nineteen, the owner of Baltimore Orioles (Jack Dunn) came to see this new prospect. Deeply impressed by the talent of George Jr, he signed him, after watching him for just one hour. To complete the contract, Jack Dunn became George Jr’s guardian. George Jr became known as ‘the Babe’ when he was introduced to the older Baltimore players. They referred to him as “Jack’s newest babe”, and this nickname stuck with him throughout his career. At this stage in his career, Babe Ruth was known more for his prowess as a pitcher than a hitter. He reflected how he had a natural affinity for the game. His games for Baltimore Orioles were sufficiently promising to attract the attention of the Boston Red Sox and on 11 July 1914, Babe Ruth won his major league début for the Boston Red Sox. During this time, he also played in a rotation for a minor league team, the Providence Grays. In 1917, Babe Ruth became more prominent in hitting, and he was allowed to move up the batting order, which gave him more opportunity to display his capacity for hitting home runs. His stats and performance were very good from the start, and by 1918, he was one of the regular star players in the Boston Red Sox lineup. 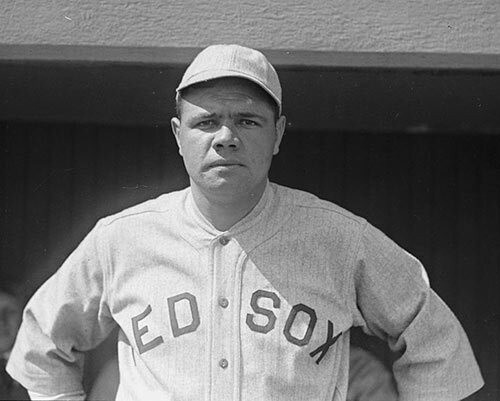 In 1918, he tied for the most number of home runs (11) and helped lead the Red Sox to the 1918 title. To avoid conscription during the First World War, until November 1918, Babe Ruth had to accept a nominal position in a steel mill. On Boxing Day 1919, Babe Ruth was sold to the New York Yankees for a record $100,000. It was a pivotal sale for both clubs. After considerable earlier success, the Boston Red Sox would not win another World Series until 2004. The New York Yankees would soon win their first titles. At the Yankees, Babe Ruth’s talent stood out even more, as he matured into the greatest hitter baseball had ever seen. He became the star of baseball, smashing records for home runs and batting averages. 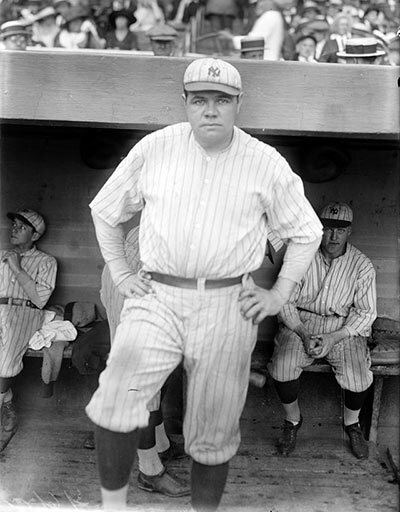 For example, in his first season with the Yankees (1920), he hit a record 54 home runs – the 2nd player had just 19. In 1921, Babe Ruth had a season-best batting average of .846 – this smashed the previous record. Babe Ruth was so successful that it changed people’s perceptions of baseball; it encouraged a more adventurous style of play with more players trying to hit home runs rather than grind out small scores. Attendance’s at the Yankees soared, and in 1923 they moved to a new stadium which became known as the ‘The House that Ruth Built”. Babe Ruth also transformed the New York Yankees into the most successful baseball team of all time. With Babe Ruth, the Yankees won seven pennants and four World Series titles. The 1927 New York Yankees team is considered one of the greatest baseball teams of all time, with Babe Ruth leading the charge with a record 60 home runs. Babe Ruth’s popularity and success put him in a unique position of being able to bargain for a higher salary. Aware of his income-generating pull, he was expert in negotiating a higher salary. Outside of baseball, Babe Ruth was renowned for his larger than life approach. Despite the era of prohibition, Babe Ruth was well known for his capacity to drink copious amounts of alcohol (without seemingly getting drunk). He was known as a womaniser and would often stay out very late. His wild social lifestyle impacted on his health and his weight often fluctuated. By the mid-1930s, his physical health had deteriorated, and he could barely run. He was married twice to Helen Woodford (1914) and Clarie Merritt Hodgson in 1929. In both marriages, they adopted a daughter Julia and Dorothy. However, Babe Ruth also had numerous affairs. As well as living a promiscuous lifestyle, Babe Ruth also took time out to visit local hospitals and charities. He was always ready to sign autographs and offer encouragement to young people. He tried to do this without attracting media attention, though the press became eager for anything that Babe Ruth did. He was also known to attend Mass – even after an all nights drinking session. He also gave money to his former school and Brother Matthias in particular. In the 1920s, Babe Ruth came to embody the American dream and the new era of the ‘Roaring Twenties’ – rising from poverty and obscurity to became the most successful sportsman of his generation. His popularity far transcended the sport. 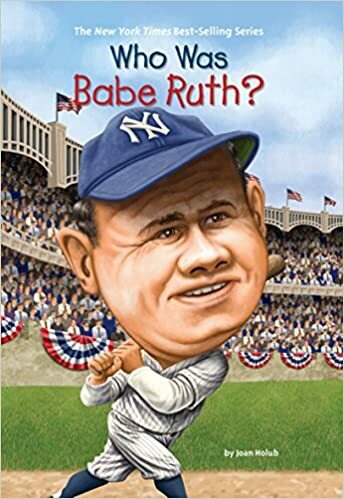 “Ruthian” has come to mean in sports, “colossal, dramatic, prodigious, magnificent; with great power.” – which is how Babe Ruth played baseball. When his career finished in 1935, Babe Ruth dominated the record books, holding 56 major league records, including the most number of career home runs – 714 – which was far beyond anyone else at the time. 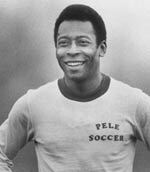 After his playing career was over, he was never successful in gaining a managerial job. Many owners felt Babe Ruth’s personal lifestyle would make management difficult because of his inability to enforce discipline. Ruth also failed to gain a job as a baseball commentator. But during the Second World War, he made many personal appearances to advance the war effort. His fame and personality still having the capacity to attract large audiences. This included a final playing appearance at Yankee Stadium in 1943. In 1946, Babe Ruth was diagnosed with a tumour on his neck, and on 16 August 1948, he died from cancer. Over 100,000 filed past his body in Yankee Stadium or attended his funeral in St Patrick’s Cathedral, New York. The Yankees’ retired Babe Ruth’s number 3 in the 1948 season. 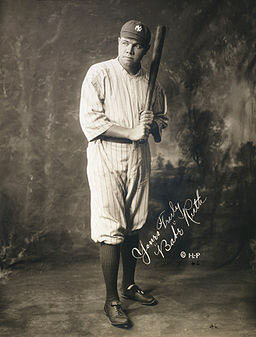 Babe Ruth was one of the first five players to be inducted into Baseball’s Hall of Fame and remains the most recognisable and famous player in the game’s history. He extended baseball’s popularity and Ruth remains the most iconic player of all time. Citation: Pettinger, Tejvan. 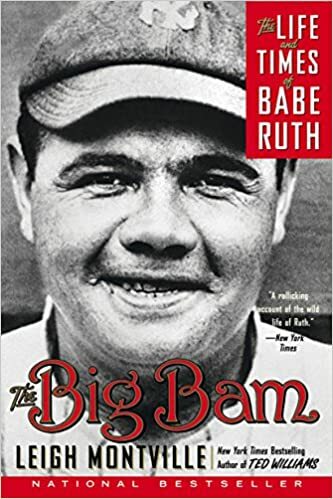 “Biography of Babe Ruth”, Oxford, www.biographyonline.net, 1 February 2015. Last updated 8 February 2018. People of the Roaring Twenties – ‘Jazz Era’ (1920-1929) The Roaring Twenties was a period of economic expansion and social change. New styles of music, dance and dress. Including Calvin Coolidge, Louis Armstrong, Al Capone and Coco Chanel. In British English. The verb is to practise. The noun is practice. I went to the piano practice. I am now practising my use of grammar.